I was immediately attracted to this Ovation model with the Rotisserie and with a 3 year guarantee. 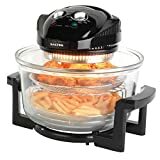 It has the mixture of the hinged lid which is very safe and the manual dials for setting temperature and time, I noticed a lot of good comments about this model on the internet and with the roti, its an outstanding price. However the comments on the Amazon site contain a few which have had a poor response from Ovation customer service. This Rotisserie Halogen Air Fryer makes it easy for you to enjoy your favourite foods, with less of the guilt. Using up to 80% less fat than a conventional fryer, this product makes cooking fried food with less oil simpler than ever. With a large 6.8L capacity and powered by 1400W, the difficulties of cooking for large parties or families is a thing of the past. Boasting an adjustable temperature control and rotisserie function, this item makes sure struggling to ensure consistent cooking in an air fryer no longer occurs. Ideal for baking, frying or roasting, the Rotisserie Halogen Air Fryer also includes a high and low rack to ensure food is cooked to perfection. An ideal accessory for any kitchen! The Ovation Halogen Air Fryer also comes with the following accessories: a high/low rack, chicken forks, baking cage and tongs. Comes with Ovation’s comprehensive 3 Year Warranty, after customer registration. I cannot really recommend this as quite a few of the comments had very scathing remarks about the Customer service at Ovation, which is a great pity since the unit cooks well and is generally well designed and made.